Poets have rarely found their calling lucrative. The occasional fortunate one finds a patron to keep him—yes, "him": almost no female poets have found patrons—in wine and cigarettes, and some, from Sidney to Byron to James Merrill, have benefitted from the inheritance of title or cash. (Merrill's father co-founded Merrill Lynch.) But the great majority have had to seek profitable work. Matthew Arnold was an inspector of schools, Wallace Stevens an insurance executive, William Carlos Williams a physician. Robert Graves used to say that his novels—I, Claudius and so on—were dogs he raised and sold in order to buy food for his beloved cat, Poetry. And of course American society today has achieved a universal solution to the problem of keeping our poets fed, housed, and insured: creative writing programs. For much of his adult life, W. H. Auden struggled with this problem. Through the 1930s he worked mostly as a schoolmaster in various English public schools, so when he came to America in 1939 (to stay, as it turned out), one of his major concerns was to find a job. Aside from a brief teaching stint at the University of Michigan, soon after his arrival, and a longer period (1942-44) at Swarthmore College, that work turned out to be writing for periodicals: The New York Times Book Review, The Nation, Commonweal, The New Republic, The Saturday Review, Harper's, even—this shows how truly omnipresent the man was—Mademoiselle. 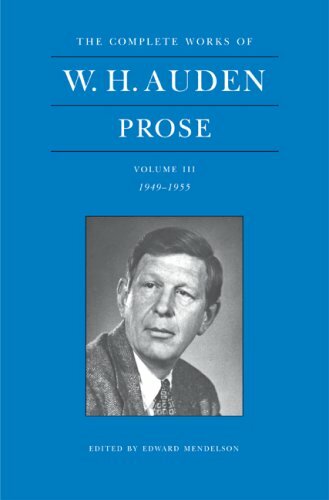 Writing in 1955 from the island of Ischia, in the Bay of Naples, Auden would say that "the winter months"—which he spent in New York—"are those in which I earn enough dollars to allow me to live here in the summer and devote myself to the unprofitable occupation of writing poetry."